Our Newcastle minibus hire service is dedicated to giving every one of our customers an experience that makes them feel confident in returning. When you have to arrange a journey for a group of people the organisation can be difficult to manage and that’s where we can be of assistance. To feel reassured about booking the trip and to get it arranged quickly, just give us a ring and have a chat with one of one amiable team. Getting people moving is what we do, so let us manage your journey today. We have years of experience with minibus hire in Newcastle, creating a safe, reliable and comfortable transport solution for all. As soon as you talk to one of our team, we know you’ll be impressed by their professionalism and interest in your booking. They will work hard to help you select the right vehicle for your needs and the size of your group, so when it arrives everything is perfect. The car you choose will be ready and waiting outside your home on the day and time agreed. It will be in excellent mechanical condition and immaculately clean, both inside and out. Choose any model you prefer from classy Volvo’s to a chic Mercedes 16 seater, or a spacious Ford Transit. No matter how many customers we help during the week, our drivers know that each person is an individual and they are trained to treat you as such. We hope you’ll be pleased with their efficiency and expert driving skills, but also their friendliness and courtesy. To find out more about our genuine dedication to customer care, take a look at our testimonials page which has many very flattering reviews about our Newcastle minibus hire service. As any resident knows, Newcastle is a busy city with plenty of heavy traffic to consider. By taking a journey in one of our minibuses, you can simply watch the world go by as you are whisked from home to your destination with no stress. 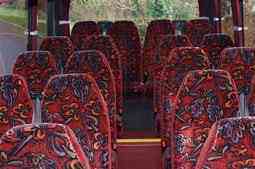 Inside one of our prestigious minibuses you’ll relax while your driver does the hard work, so forget about where you’ll park or if you’ll arrive on time, because we have it covered. There is no stopping to get petrol with a packed car, or trying to negotiate the best route across town, in fact the chauffeur driven experience is probably something you could easily get used to. Newcastle sits to the north of the Tyne River, in Tyne and Wear. It is home to a premier league football team, Newcastle United F.C. and the prestigious Newcastle University, an establishment which can trace its history back to the 1800’s. It is a well cultured city with a number of heritage attractions, galleries and museums to visit. However, it also has a thriving nightlife and plenty of opportunities for shopping. 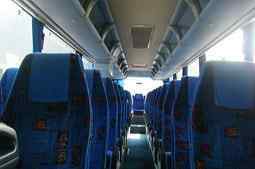 If you’re intending to visit with a larger group of family or friends, it can be difficult to navigate your way around, but with minibus hire in Newcastle there’s no need to worry. Once we know where to pick you up and when, we’ll be ready when you are! For people who love to browse the bargains, or treat themselves to something really special, Newcastle’s intu mall at Eldon Square is ideal. It’s packed with big-name modern outlets and cool boutiques that every fashionista will appreciate. Rather than struggling to the car park or bus with heavy bags, allow us to spoil you and your friends with an indulgent chauffeur driven journey home. For people who love to party in the open air, Newcastle is an ideal destination. There are a huge number of festivals and concerts taking place throughout the year and these have extremely varied themes. In May 2016, Busted will be playing at the Metro Radio Area, and in the same month, St James Park will host the Magic Weekend, a celebration that will include family entertainment, live music and plenty of rugby. Later in the year, The North Sea Tall Ships Regatta will be held during August, making it the ideal excursion for fans of nautical history. To get to any of these venues without the hassle of driving, parking and map reading yourself, give us a call and make a booking today. The Newcastle Race Course holds numerous meetings every year and these are accessible to seasoned visitors and novices alike. If you feel like having a flutter at The Foundation of Light Race Day in August 2016, or at the Equine Products Race Day in October 2016, you can make a day of it by travelling in one of our exclusive minibuses. 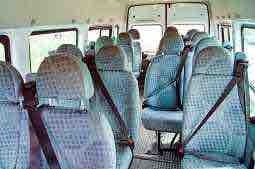 For the best in Newcastle minibus hire, choose our service to get you and your party where you want to be. We can offer you the right balance between affordability and excellence, ensuring every trip you make with a large group of people is free from stress and runs smoothly. So when you are travelling anywhere in Newcastle, from the NE1 postcode area in the city centre, to Wooler at NE71, we’re there for you.